I’m not a big purse person, never have been, and I don’t care to have decorated ones as a result. The idea of customizing one though? Sign me up! This idea comes from the folks at StudioDIY, and is all about making a custom donut image for your round purse, but if they’re not your thing, I don’t see why you can’t apply these methods there to any purse/bag you like! You’ll want to visit the DIY page to make sure you understand the process to tweak it to your needs, but here’s the quick run down of supplies required for this project. It involves lots of spray adhesive to get everything together, so you’ll want to make sure you’re in a well ventilated space or outdoors so fumes don’t become over powering. I’m not sure if this would work on fabric, but I think it would since it’s mostly the adhesive keeping things in place. So if you’ll excuse me, I have a blank to tote to customize. I found something online after my boyfriend gave me an idea. It’s all about decals and how cool they are. The only decals I’d really used before putting up my own erasable decal calendar in my work room were holiday decorations that you could put up and remove from windows during those times of the year. And a calendar I bought to put up on the wall of my workshop so I could mark things down as they came up. You can call my experience limited. My boyfriend recommended I put some of our Super Mario decals that I bought him as a gift one year, on my kitchen mixer. I love my kitchen mixer and I love Mario so the idea seemed great! It got me thinking though, about what other decals you could make. They couldn’t be too hard to do, given that the most difficult part would be finding the materials. Upon searching, I found that materials weren’t that hard to find, either. The most difficult thing to find will be wall vinyl (or sometimes you can also find shelving liners) which you can check out your local hardware store or you can order it from amazon (you’ll just need to search a little to get ones that aren’t pre printed – focus on “wall vinyl” for keywords). 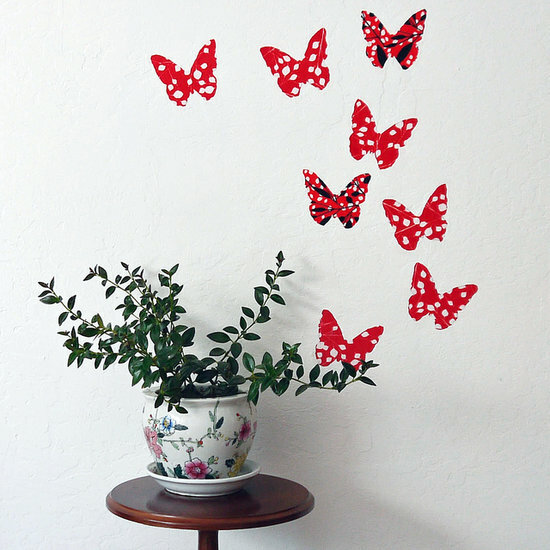 There’s also this website that sells printed designs as well as panels of patterned vinyl. Once you have this there’s a number of things you can do with it from decorating your walls and windows, to decorating anything with a smooth surface like the fridge a mixer, and your cupboards. There are many many different things you can do and once you have a short tutorial you can let your imagination go wild! There are tutorials all over for this kind of thing. The second thing you should do is pick a design. You can find multiple good designs online if you use search terms that suit your tastes. Just make sure to include the term “stencil” so that you can find something that would be appropriate for wall vinyl. Remember, you want easy to cut, stable lines so that it will look fantastic on the wall. Take a look at the one to the left. It’s blocky, but would look amazing on a wall. 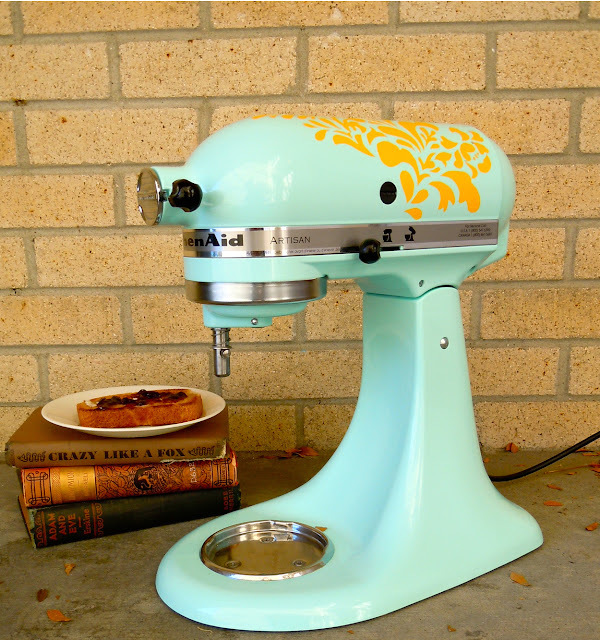 You can also pick something more complicated, like the decal that was used on the mixer, but you may want to try a few times first. She has a tutorial for how she did hers here. I recommend if you’re going to be doing something that intricate, to follow a tutorial if it’s your first time. The second thing you can do is you can design something yourself. If you’re looking to create something more abstract or something that you created, this is a good way to go. Either way you do it… you will need to trace your design onto the wall vinyl once you’ve got it selected. You can do this by cutting out the black spaces on your printout and then trace the empty space by taping it to the vinyl if it is small enough. If it is a big piece you’re doing you may need to eyball it – like for the piece below. This image is a beautiful hand done piece that was put together in many separate pieces. Photo credit to an Instructables poster. Once you’ve got everything traced, you’ll need to cut it all out. Remember, you’ll only stick the black parts of the design to the wall and let the white sections communicate your image through negative space. If you’re doing a large design, you also may have to cut your design into different sections before you can stick them to the wall, but don’t worry, if you line everything up, the sections should be barely noticeable. The last step is to stick and press the vinyl to your wall. Make sure your wall is clean and dry and be as accurate as you can with your placement. Just like window decals, these will be harder to stick up a second or third time. Once you have the placement where you would like it, the last thing you need to do is squeeze the air bubbles out of it and smooth it down as much as you can (see above). 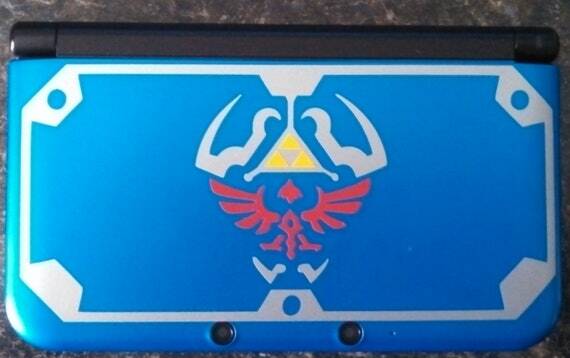 One of the easier ways to do it is to use a credit card to smooth from the centre of your decal and out to the edges. Most wall vinyl decals are easy to remove. You should just need to peel it off when you’re done with it but as always, check the instructions that come with the product to be sure. This is a great way to decorate spaces that you don’t necessarily want (or can’t) drill holes into, and a marvelous way to add a touch of your own artwork without needing to be skilled in painting or sketching. Let your imagination run wild and create something that’s just for you! As many of you that game out there will know, Nintendo recently launched their updated version of their popular 3DS system. As they often do with these kinds of things, along with basic editions were special ones. I personally would’ve loved to get my hands on their Major’s Mask edition due to my love of the Zelda series, but they sold out crazy fast and I just shrugged and did what I always do when that happens. I went looking for a way to make mine more custom. I knew back during Magfest that I would be getting one of the new systems and I was so happy to see Game Themed Things was there to fill my need. I love vinyl decorations for their durability and long life already but this couple takes the hobby to a whole other level with their designs. Never before have I seen so many custom creations with layers and layers of color like their. Like Pokemon? 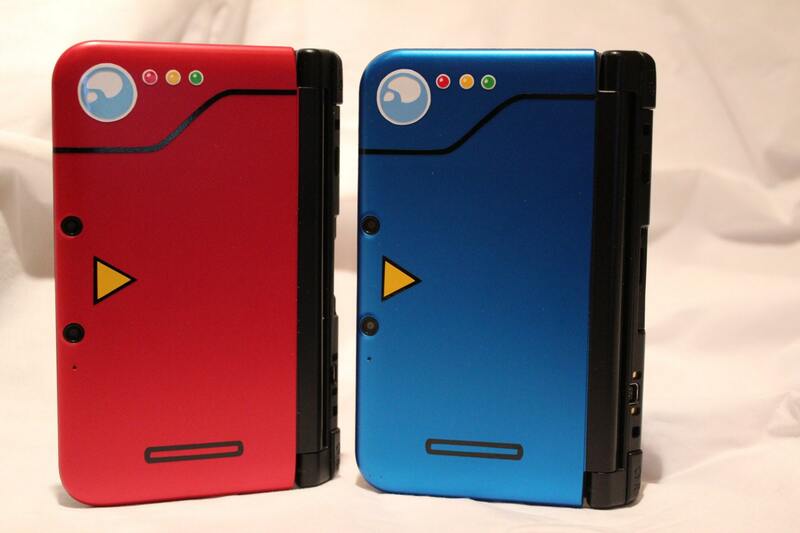 Want to turn your 3DS into a pokedex? They’ve got you covered!